We have all along upheld the three princ iples of equality, mutual trust and common development. As a result, bilateral relationship has come a long way over the years. 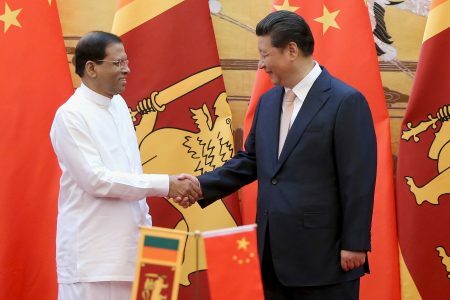 Now, our bilateral relationship is presented with new opportunities as China has embarked on a new journey of socialism with Chinese characteristics which spells new prospects for China-Nepal co-operation, and in Nepal we have seen that political transformation has been smoothly completed, and presented the country with new opportunities. It is our hope that our two sides will seize these favorable conditions to work for even greater progress in our bilateral relations. On high level exchanges, we believe that such exchanges can serve as a guidance for the growth of bilateral relations. We look forward to an early visit by Rt. Hon. Prime Minister KP Sharma Oli to China, and we highly commend the renewal of gracious invitation from Nepal to China on the visit of Chinese top leadershipand we stand ready to facilitate such visits. The two of us have agreed on deepening political trust. 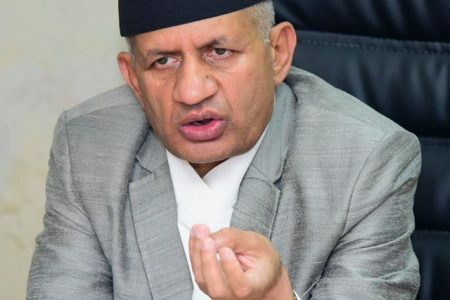 China appreciates what the Foreign Minister of Nepal has reiterated in unequivocal terms, the commitment to one-China policy and that Tibet and Taiwan-related affairs are purely China’s internal affairs, and that Tibet and Taiwan are integral parts of China’s territory, and that Nepal will never allow the use of its soil for any anti-China activities. The two of us have also agreed on making further progress in cross border economic co-operation zone, in completing the FTA feasibility studies for early start of official negotiations, for supporting of efforts to diversify sources of energy and for the post-earthquake reconstruction in particular in projectsinvolving improvement of people’s lives. We have also agreed to develop the transit and connectivity between our two countries including better services of the ports, and the repair and opening of two important roads the Arniko Highway and Syafrubesi-Rasuwagadhi Highway and we will make sure that we will have greater co-operation in civil aviation as well. We have agreed to expedite the process regarding the agreements on utilization of existing highways of Tibet for cargo transport for Nepal and transit transportation. As we have discussed, we will continue to deepen our mutually beneficial co-operation. Nepal after completing the political transition will start economic transformation in particular in areas relating to people’s livelihoods. China will give full support and China will continue to encourage Chinese businesses to invest in Nepal in light of need of the ground to contribute to local development. We will welcome Nepal in China Import Expo to be held in November. The two of us have agreed on the growth of people-to-people exchange so as to cement the popular support for the overall bilateral relationship. Our two countries enjoy traditional friendship, our two countries are friends in need and friends in deed. Our friendship has grown from strength to strength. China will continue to hold the China Festival in Nepal and we have got support from Nepal as always for the management and operation in China Cultural Centre, Confucius Institute and Confucius classrooms. China will encourage more Chinese citizens to travel to Nepal with the need that in this area huge potentials are locked and tourism co-operation can also help our countries to deepening understanding. We are firmly convinced that this new starting point in the growth of our bilateral relations will deliver more benefits for our two peoples and help achieve greater peace, stability and prosperity in the region and beyond.